Adam Cvijanovic's large-scale landscape painting spans the Hammer Lobby Wall, evoking the Hudson River School and 19th-century cycloramas. 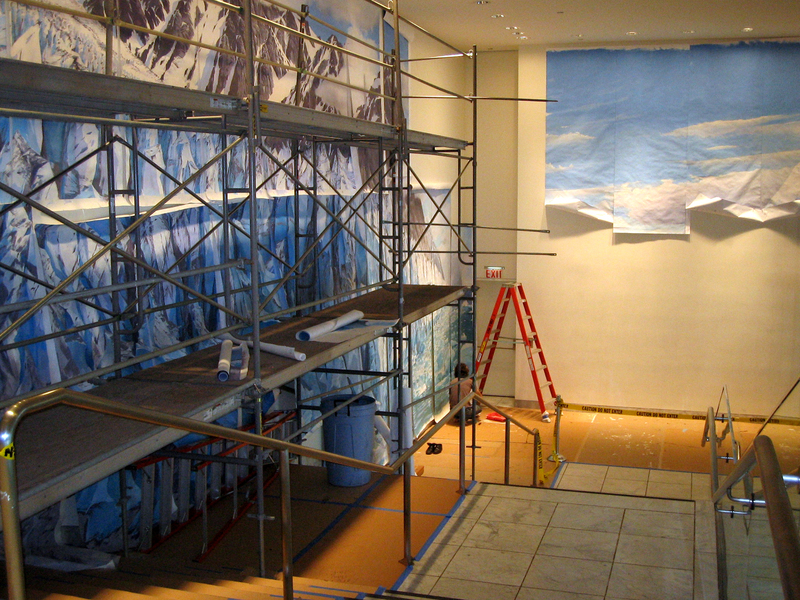 His room-sized installations—made of smaller Tyvek panels mounted side-by-side—portray beautiful, yet charged natural scenes that challenge the seemingly sacred divisions between mass-produced and the unique, the decorative and the profound. Adam Cvijanovic was born in Cambridge, Massachusetts, in 1960 and currently lives in New York City. A self-taught artist, Cvijanovic is an adjunct professor at Rhode Island School of Design. Recent solo exhibitions include Ideal City at Pennsylvania Academy of Fine Art, Philadelphia; Hurricane Party and Disko Bay, both at Bellwether Gallery, New York; and New City Project at Steven Sclaroff. His work has been included in recent group exhibitions at Compact Art, Barcelona; Fabric Workshop and Museum, Philadelphia; Rhode Island School of Design Museum, Providence; and BAM Brooklyn. Although many words can describe glaciers—magnificent, desolate, pristine—ambiguous is not one of them. Trillions of tons of frozen water massed in continent-size sheets grinding over 10 percent of the earth’s surface tend to resist interpretation and relativistic philosophizing. Like all forces of nature, they demand acceptance on their own terms. Glaciers, in short, are just that—glaciers. 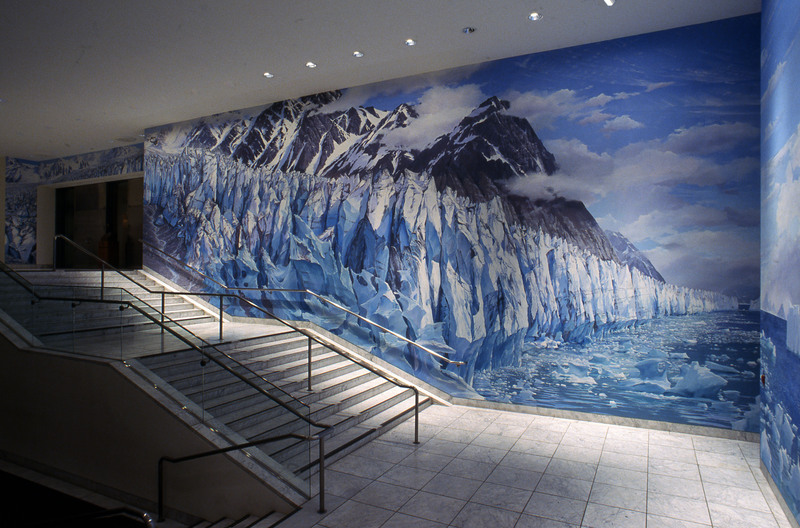 And so we might wonder about an eighty-by-twenty-foot depiction of an imaginary glacier, rendered in precise, scientifically accurate terms and mounted on a wall at the UCLA Hammer Museum. 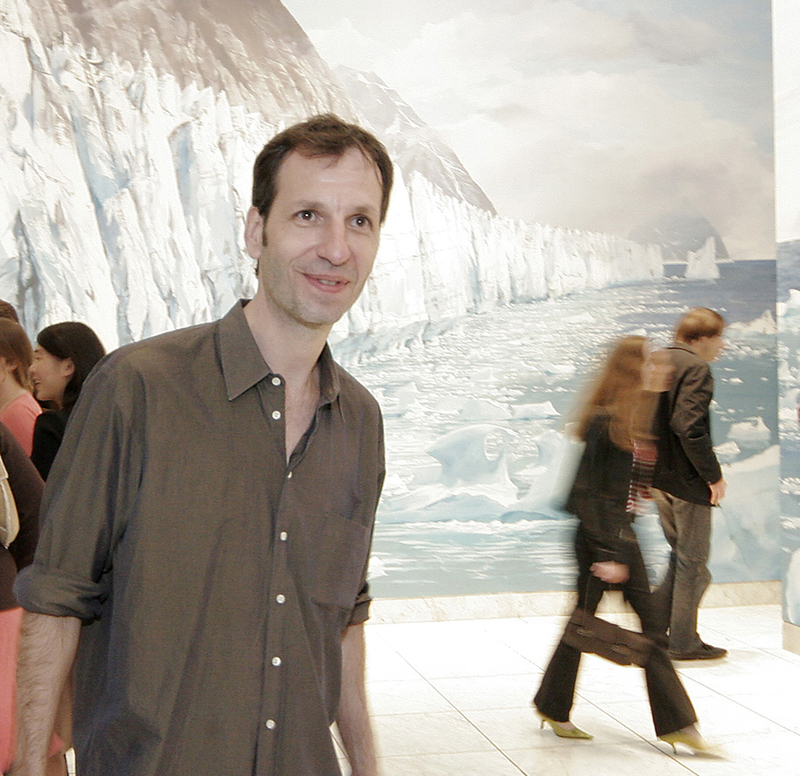 What more can a painting—even one of these dimensions—tell us about massive ice floes? A lot, it turns out, especially if the work is created by Adam Cvijanovic, a New York artist who specializes in room-size wall murals. With characteristic simplicity, subtlety, and a kind of aesthetic wisdom, Cvijanovic captures the majesty of glaciers while revealing in the hard, cold facts of their existence surprising layers of meaning and associations, ranging from ecology to physics to the destiny of human beings and the stars. On an even more profound level, the work suggests the artist’s own belief in an intimate universe where the laws of nature yield to a larger, more redemptive power of hope and renewal. A portrayal of one of the most inhospitable regions on earth, Glacier is far from inhospitable itself. There is nothing “couch-sized” about Glacier. Yet in keeping with the rest of Cvijanovic’s work, there is nothing exhibitionistic or overbearing about it either. In reaching for the sublime, Cvijanovic wisely avoids trying to outdo the resplendent landscapes of nineteenth-century Romantics—Frederic Church, say, or Caspar David Friedrich—opting instead to infuse his ice floe with a modest, almost introverted, sense of natural process. Descending from snowstorms in the upper left of the image, an ever-broadening esplanade of ice advances to the sea, where it begins to break apart, or “calve.” On the lower right, and sprinkled atop the calving ice sheets, are moraines gouged out by the glacier—stones and dirt acting as lubricants to assist the ice’s inexorable passage. Meanwhile, chunks of ice and icebergs drift into the currents, where they will eventually dissolve, replenishing the ocean, leading to new snowstorms and the cycle’s renewal. But Glacier is more than a natural history lecture: Cvijanovic codes within it a kind of tragic view of life. As the ice calves near the glacier’s terminus, for example, it forms increasingly distinct, almost human figures, seemingly preparing to plunge into the sea, in which two icebergs drift toward a distant and lonely horizon. Visually and psychically balancing the enormous panorama to their right, these two forms suggest individuals who, because of circumstances or inner nature, have separated themselves from the herd to embark upon their destinies—a journey that will eventually end, however, with their melting into the sea. The hard facts of dissolution, of nonexistence, await the icebergs, as they do us all. And not only us: as the mighty glacier flows toward inevitable annihilation, so too does life in general, its energies winding down into the stasis of entropy. 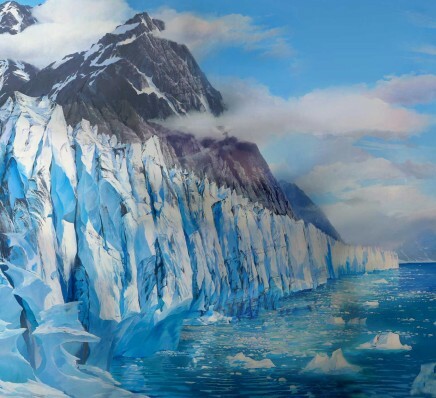 “All that is solid melts into air,” Karl Marx said in another context; in the natural world suggested in Glacier, the air too will someday fade away. So far, this gloomy lesson in thermodynamics is something an illustration or photograph could impart. But Cvijanovic’s artistry takes the work to another level. Far from denying the impermanence of life, Glacier’s soft colors, self-possessed imagery, and deep sense of humility seem to embrace and affirm it. Rejecting the obsession with the pure and transcendent manifested by the modernism of his father and Gropius, Cvijanovic instead evinces an awareness that no human activity, art included, can escape the transience of existence. Snow falls, glaciers creep, icebergs dissolve, the cycle starts anew, even as physics tells us that everything, even massive ice floes, will someday vanish into nothingness. And yet, as Glacier seems to declare, this is beautiful, this is good. And what of us, gazing up at this monumental image? 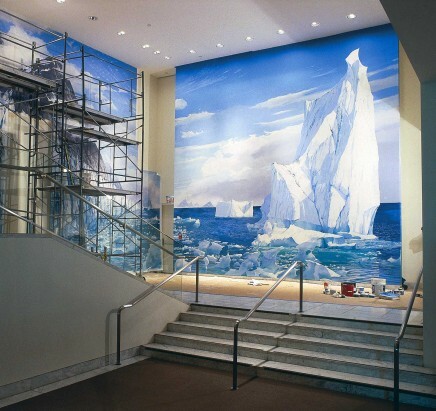 As we descend the staircase roughly paralleling the descent of the ice floe, we see before us an “Exit” sign and door interrupting the sweep of the mural’s image. Far from an unwelcome intrusion of reality, the door is actually a fundamental aspect of Glacier, reminding us that, after all, this is a museum in Los Angeles, not the end of the earth. We too belong to a process of nature; we too will someday step through a door marked “Exit” and embark on another journey. And on that passage we will take nothing with us, save perhaps a faith that the God immanent in the awesome power of nature is also present in the final melting of the heart and the subsequent flight of the soul. Steven Vincent is a freelance journalist who has lived in New York City for twenty-five years. He specializes in investigative journalism, art criticism, and, more recently, writing about the Middle East and the war in Iraq. He recently published In the Red Zone: A Journey into the Soul of Iraq. Hammer Projects are organized by James Elaine, and are made possible with support from The Horace W. Goldsmith Foundation, The Annenberg Foundation, the Los Angeles County Arts Commission, and members of the Hammer Circle. Adam Cvijanovic's residency is made possible by a grant from the Nimoy Foundation.